This lecture examines the impact of psychological factors on the stress response. The heart of the lecture consists of a description of the effects of control, predictability, feedback and coping responses on the development of ulcers in rats - an animal model of human stress. This material presents you with a challenging paradox. A series of elegantly designed experiments are described that undoubtedly involved considerable animal suffering, but which resulted in the formulation of a theory of the relationship between behaviour and stress that could help to alleviate human illness and suffering. It is up to you to decide on the ethical questions provoked by this material. Many people claim that they find their working lives stressful. Indeed the 'executive lifestyle' has often been linked to higher than normal levels of stress. In part this is because of a famous experiment entitled "Stress in Executive Monkeys" carried out in the 1950s by Joseph Brady (Brady,1958). Brady found that monkeys who pressed a lever on an operant schedule (worked) to avoid electric shock, died from ulceration. In contrast, ‘yoked’ subjects - monkeys that got the same amount of shocks as their worker companion but who did not have to work on the schedule - did not ulcerate. Brady's experiment has entered popular culture, but it is probably a myth. The results are probably an artifact caused by inadequate experimental design. It appears that the monkeys in the experiment were not randomly assigned to ‘executive’ and ‘yoked’ treatments. monkeys who failed to learn were put into the yoked condition. In 1971 Weiss repeated Brady’s experiment using rats. He used a specially constructed narrow testing box which was equipped with a paddle that a rat could operate with its paws. Shock was delivered through tail electrodes so that the animal could not adopt postures that alleviated the effect of foot shock. He examined the effects of various psychological factors on the development of stomach ulcers - a measure of stress. 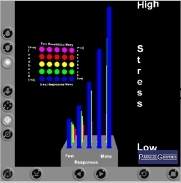 Weiss examined the effect of control on the stress response. For example, if you find the prospect of failing an exam stressful, writing a good exam paper is a coping response you can use to control the situation. You can avoid failure by writing a good answer. Rat 1 put into apparatus but received no shock. Therefore the amount of stress exhibited by this rat is a measure of the stressfulness of being constrained in the test apparatus. Rat 2 could avoid and escape shock by pressing lever. Therefore this rat can use a coping response to control shock delivery. Rat 3 yoked to Rat 2 received shock when Rat 2 failed to emit an avoidance or escape response. Rat 3 could not avoid or escape shock by pressing the lever. Therefore this rat has no control over the stressor. The stress response of the yoked rat is of critical importance in this experiment. How will it react to being in an uncontrollable situation? In terms of our exam paper example, the yoked rat is in the bizzare situation of a student whose exam mark does not depend on how well they answer the exam questions. Instead their mark is exactly the same as that given to the person sitting beside them in the examination room! Rats in the 'No shock' control group showed a small amount of ulceration. Rats that were able to use a coping response to control shock showed an intermediate stress response. The important finding is that rats with no control over shock delivery had significantly greater stomach ulceration than rats that received exactly the same amount of electric shock but were able to avoid or excape from it. Because the yoked group experienced the same amount of physical stressor (shock) as the avoidance/escape group, a psychological factor - lack of control over the situation - must be responsible for difference between these groups. In terms of our human example, it would be much more stressful if you failed an exam on account of the poor performance of the student sitting next to you, than if you failed on account of your own poor answers. In a separate experiment, Weiss examined the effect of predictability on ulceration. If you find exams stressful, would you prefer advance warning of the exam date? Imagine a situation in which half the class knew the exam date, but it was a secret for the other students. What group would you prefer to be in? Rat 1 put into apparatus but received no shock Rat 2 received a warning signal before shock. Rat 3 yoked to Rat 2 received no warning signal before shock. Rats given signalled shock had an intermediate amount of ulceration. Because both the yoked groups experienced the same amount of psysical stressor (shock), a psychological factor - predictability must be responsible for difference between these groups. In terms of our example, it would be more stressful if the date of examinations was kept secret. There is a third factor that has an important impact on the intensity of an individual's stress response. Weiss recorded the total number of responses made by rats in these experiments. Now a rat placed on an signalled avoidance schedule only needs to make an avoidance response when the warning signal comes on. Any extra responses made in the absence of the warning signal have no programmed consequences - they do not affect the delivery of shock. But rats on these schedules often make several 'inter-trial' responses. Yoked rats can also make operant responses, but of course none of their responses effect shock avoidance. Weiss examined results from all his subjects and found that response rate effected ulceration. The more responses the animal made the greater was its ulceration. By matching data from high responding rats that that were able to avoid shock with data from yoked rats that emitted very few responses he was able to show Brady’s executive monkey effect. In other words 'running around like a headless chicken' may be bad for your health! Weiss showed that relevant feedback reduces the impact of a stressor . In this experiment feedback refers to the signal that follows a response. In an avoidance situation with light as the warning signal, the light going off is relevant feedback which tells the rat that it is now in a safe situation. An even more stressful situation involves negative feedback. This is a situation in which you find yourself in circumstances where 'the rules of the game have changed'. This can happen in business where the boss decides that the company needs to change direction and the workers either don't understand, agree or have the skills to adapt. The diagram shows that negative feedback - in which the avoidance response actually switches the shock on - produces severe ulceration. In the light of these results Weiss developed a three dimensional theory of the relationship between responding, feedback and ulceration. For a given level of feedback, the more responses the subjects emits the greater the amount of ulceration. For a given number of responses, the less relevant the feedback, the greater the amount of ulceration. Use the National Institute of Standards and Technology website to automatically detect the correct VRML plugin for your browser. Here is a simulation which allows you to explore the relationship between responses and relevant feedback in Weiss' model. You need a VRML plugin to view the model which can be obtained here. Column height represents the intensity of the stress response. You can turn columns on and off by clicking on the panel of circles within the model. The controls provided by the plugin allow you to zoom, pan and rotate the model. You can use the controls provided by your VRML plugin to explore the relationship between feedback and ulceration. You can use the controls provided by your VRML plugin to explore the relationship between response rate and ulceration. How does your personal coping style relate to the elements presented in Weiss' model? There is some research on humans that may be explained by Weiss' model. Bourne studied plasma cortisol (a stress hormone) levels in US soldiers in Viet Nam before, during, and after the Viet Cong (VC) were expected to attack their camp situated on the Ho Chi Min trail. This route was used by the VC to transport arms and supplies from North to South Viet Nam. He found suprising results. On the day when the soldiers (NCOs) were preparing for the attack their cortisol levels actually dropped, whereas they rose in the officers and radio operator. Can you explain the paradoxical finding of low stress hormones in NCOs in terms of the coping responses available to these soldiers as a result of their military training. Why do you think the officer showed the normal elevation of stress hormones in anticipation of the attack? Can you explain this in terms of what the officer had to do in preparation for the attack? Why might the radio operator reacted in the way he did in this situation? Bourne argued that the soldiers' training had equipped them with psychological defence mechanisms - coping responses - that they could employ in dangerous situations. Many of the soldiers believed that if they followed the instructions they had received in training they would be protected from harm. In addition, they had a whole range of practical responses that they must carry out before the attack - filling sandbags, checking weapons and ammunition supplies etc. Bourne argued that military training had given the NCOs coping responses they could employ to control the situation they found themselves in. In contrast the radio operator and officers are in receipt of a great deal of intelligence information about the upcoming attack but they have no ways of coping with this precise situation. No amount of training could prepare them for the reality of the actual event with all its surrounding uncertainties. Here is another example of how Weiss' model may explain the behaviour of people in real life situations. Janis studied the relationship between the fear expressed by patients awaiting abdominal surgery and their post-operative recovery. Curiously, patients who showed little pre-operative anxiety had poorer post-operative adjustment than those who showed moderate levels of fear pre-operatively. Maybe the calm patients were failing to accurately predict the amount of discomfort they would experience after the operation. 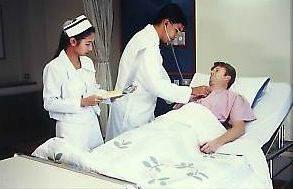 The patients who showed high levels of anxiety pre-op also fared poorly after the operation. Maybe they are like Weiss' rats who showed adverse effects from making a large number of coping responses. Thus it is possible that the attempts we make to cope with stressful situations - together with the amount of control and information we have about dangerous situations - can influence our bodies physiological response to stressors. Brady (1958). Ulcers in "Executive" monkeys. Science, 199, 95-100. Weiss (1971). Journal of Comparative and Physiological Psychology, 77, 1-30. Weiss (1972). Psychological factors in stress and disease, Scientific American, June, 1972, reprinted in Atkinson and Atkinson (Eds) Mind and Behaviour, Freeman, San Francisco, 1980.